For many people, chatting to friends is a major reason to use Facebook’s app on their smartphone. But soon they will have to download the social network’s partner app, called Messenger, to carry on their instant conversations. Facebook is reportedly notifying users of its popular app that they will no longer be able to send 'chat' messages and will instead have to swap to Messenger, which was launched three years ago. It follows the company's acquisition of another popular messaging app, WhatsApp, for US$19billion. People living in Europe with Android handsets and iPhones will be the first to be affected by the change, according to the company, which did not reveal a specific timeline. The company halted messaging in the main app for people who have already downloaded Messenger in November, following the launch of Messenger 3.0. The Messenger app works in a similar way to Facebook’s core message feature, and users will tap a ‘message’ icon within the main app to be directed to Messenger. 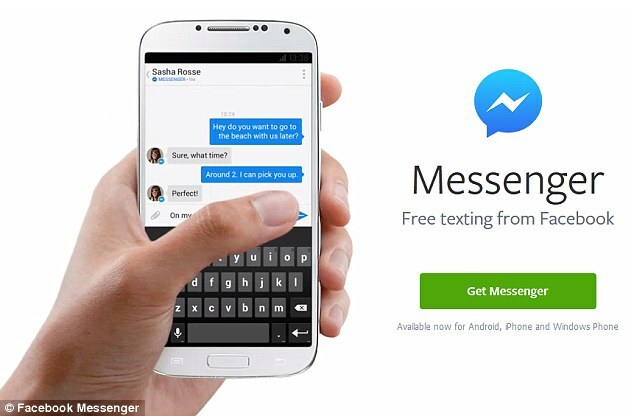 Facebook has indicated that it is taking renewed interest in its messaging features following the WhatsApp takeover. WhatsApp is particularly popular outside America and lets people send unlimited messages for US$0.99cents a year. 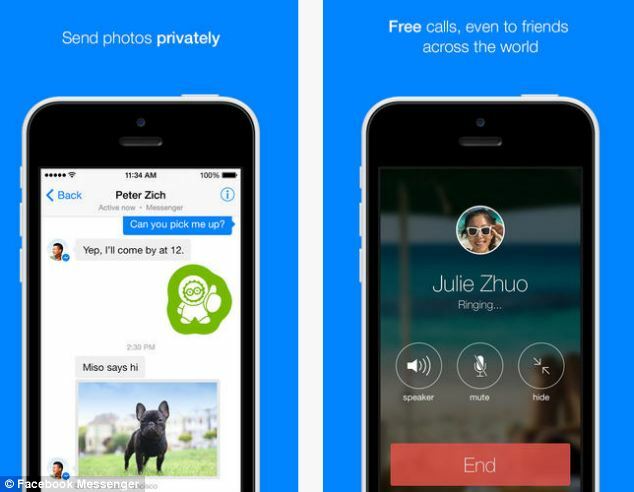 It has been widely reported that Facebook has no immediate plans to merge WhatsApp with Messenger. MailOnline is awaiting a response from Facebook. Both services, as well as many more, are becoming a mainstream alternative to texting, particularly in parts of the world like Africa, India and South America where unlimited texts are not included in mobile contract bundles. Not just for status updates? In the future you could also use Facebook to make electronic payments and stash money. In the future, Facebook's 1.2-billion users could use the network to make electronic payments and save money as well as send messages. The social network is rumoured to be seeking regulatory approval to offer financial services - including electronic money and remittances - which would, for example, allow foreign workers to easily transfer money back to their families. The Central Bank of Ireland told MailOnline 'it is not commenting on the issue at the moment', and Facebook said it does not comment on rumour or speculation. A move into remittances would help Facebook gain an even stronger foothold in emerging markets including India and Africa. If those in developing nations flock to Facebook, the company would boost its advertising revenues, and e-money services could become a big attraction - it would be particularly useful to users in areas without easy access to banks. Elizabeth Cobbett, lecturer in International Political Economy at the University of East Anglia (UEA), told MailOnline: 'The materiality of banking and finance is changing rapidly and this change is most visible in emerging markets where they do not have the infrastructure in place. So it is a clean slate for new technology. She explained that there are two-and-a-half billion 'unbanked' adults across the globe and so the potential market is huge. Zzzzzzzzzzzzzzzzzzzzzzzzzzzzzzzzzzzzzzzzz. i can't stand face fux. as i call it. and here's the thing, it's a useless site that has people talk less to each other. and by that i mean in person or on the phone. screw texting, or twitter that bullsh*t.
people don't talk on the phone anymore it feels like. at work i see these idiots. some friends of mine. text each other and they are sittting across from each other. if you want to talk that bad enough to each other than bloody talk to each other right there. and don't give me the reason that what if it's private? than go somewhere private and talk. that's my 2 or 3 cents. i dunno if anyone agrees with me or not. but i don't have a face fux. and i had a myspace page a friend made for me, and i asked him dude why did you do that? i'm never going to use it. it was nice of him to do it i''ll give you that. but i don't have a life as it is. and what am i going to say on it, i got up went to the bathroom and now i'm back on the computer? unless you are talking to someone online with the 2 of you. nobody needs to know that in a public forum like these stupid sites. i can't say that it's kids today cause adults do it as well. call me old fashion i don't care but that's my thoughts about it. Social media make people less social! I sooooo agree with you guys & I HATE FBuck.. Have you noticed how bad their Admin Techs are, the whole site is crapppppp!... Its all about money...as usual..
To me only the lonely and the bored use such sites. Thanks for posting your thoughts..
ooh i agree with you again Lady. like i said my mom and brother have face fux well they use it. and i can't answer for my brother but my mom doesn't put personal stuff on it. i dunno how bad anything on that site is cause i've never used it and i don't plan to either. but my mom and brother don't check it at work. well my brother might but i doubt it. my mom sure as hell doesn't. in short she's careful what she posts. what gets me the most is these douch bags and that includes women to who post stuff on them and they think it's an e-mail! and than they get pissed if they either get fired from their job or wonder why this or that person is mad at them? go figure. Facebook may have started a new standard for deep-linking across all mobile platforms. The new App Links take away the hassle of switching from an app directly into another. Users can now open apps and online content easily without being interrupted with new Web browsers from time to time. On April 30, Facebook, together with "Parse" CEO and Co-founder Ilya Sukhar, announced "Applinks.org." It is Facebook's new solution to deep-linking for apps that will make mobile browsing for online content easier. This new scheme will help both developers and users in many ways. One problem that users face is when they open third-party apps. 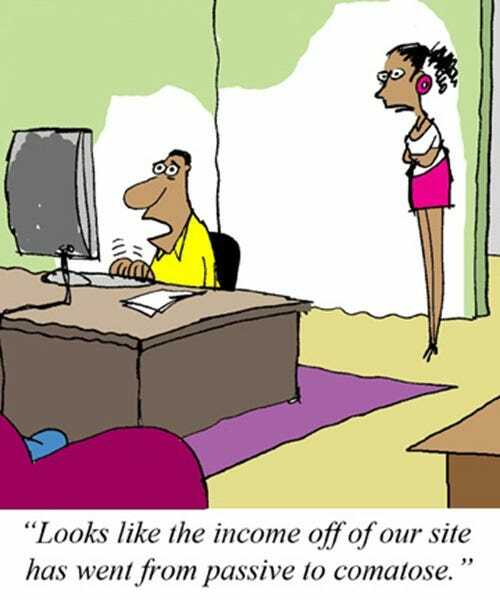 They are stuck with the Web browser where they have to log in again. Users find this situation an annoying experience. App Links work by finding a Web URL compatible to a mobile app, and opening that content in the same app instead of a new Web browser. The app does the work for users in searching the Web without multitasking several apps or Web browsers at the same time. One of the good things about App Links is that it's open and already uses deep linking by OS providers. It's also not an issue if developers use an app index from Facebook or anywhere else. 1. Developers are provided a source for a software development kit (SDK) from where more applications can be created. 2. They work in all platforms, so there won't be issues in any mobile specifications. 3. Facebook's App Index helps users check for any URL that can be easily deep-linked. App Links are truly cross-platform and an open standard available for everyone without being restricted to a specific mobile.